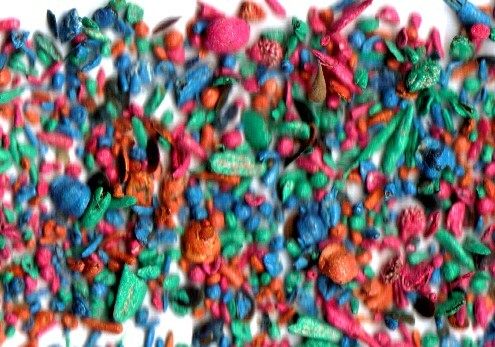 These wildflower seeds are coated with bright colors, this coating allows for easy handling and planting since you can see the seeds. This wildflower mix is perfect for your butterfly garden, or for a wildflower meadow. bachelor button 8%, California poppy 8%, baby's breath 6%, annual lupine 6%, blue flax 6%, the following are 5% or less; lance leaved coreopsis, cosmos, Chinese forget me not, sweet alyssum, scarlet flax, sweet william, bearded dianthus, Indian blanket, godetia, mallow, purple coneflower, plains coreopsis, rocket larkspur, african daisy, corn poppy, prairie coneflower, clarkia, columbine, and white yarrow. do not plant more than 1/4 inch deep, keep moist while starting.